Everyone who’s played the Tempest port for the 2600 knows that a game such as that simply couldn’t work on the 2600’s constrictive hardware. Enter Sirius Software, under ownership of Fox, who decided to make a Tempest-like game for the 2600, and as everyone who’s played Turmoil knows they succeeded. Turmoil takes the essence of Tempest’s gameplay and makes it vertical, no graphically complex geometric shapes here, just straight lines. All you have to do in Turmoil is move up and down a straight track and shoot oncoming enemies, you will encounter a few that you cannot simply shoot, they require strategy. Tanks can only be destroyed when shot from behind and the pulsating orbs that sit at the edge of the screen have to be collected, then you must evade the invincible enemy that appears afterward. The enemy designs are fantastic, the tanks, TIE fighters, and other weird 80’s ship designs, are all wonderfully detailed and suitably rainbow. You may also notice at the bottom of the screen in the attract mode there is a spy guy from Fast Eddie, I think that’s just adorable if not slightly out of place. 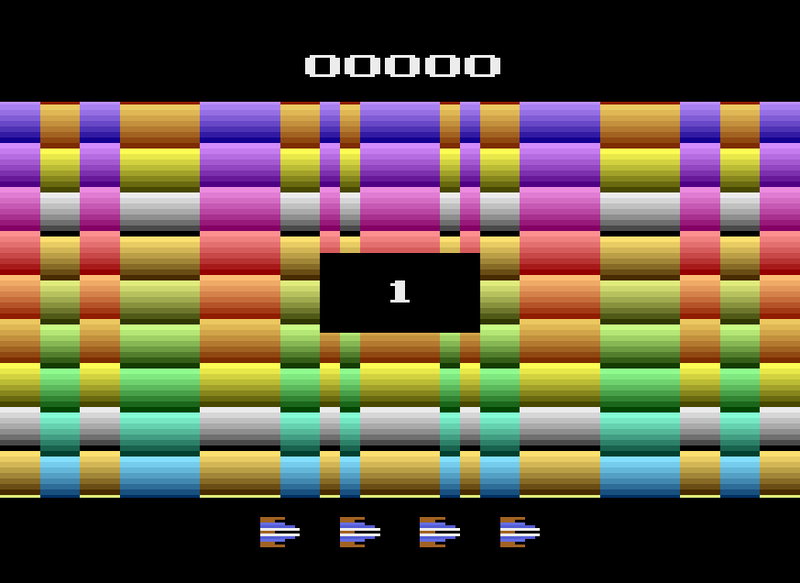 I mentioned that the enemy designs are rainbow, well take a look at that screen transition, holy crap; I think it’s displaying every color the 2600 is capable of at the same time. The sounds are a bit lackluster, mainly because there is an absence of a good chunky explosion noise whenever you destroy an enemy, all you’ll really be hearing is the sounds of you shooting. The rest of the soundtrack is generic beeps and boops, the standard stuff that we all know and love. 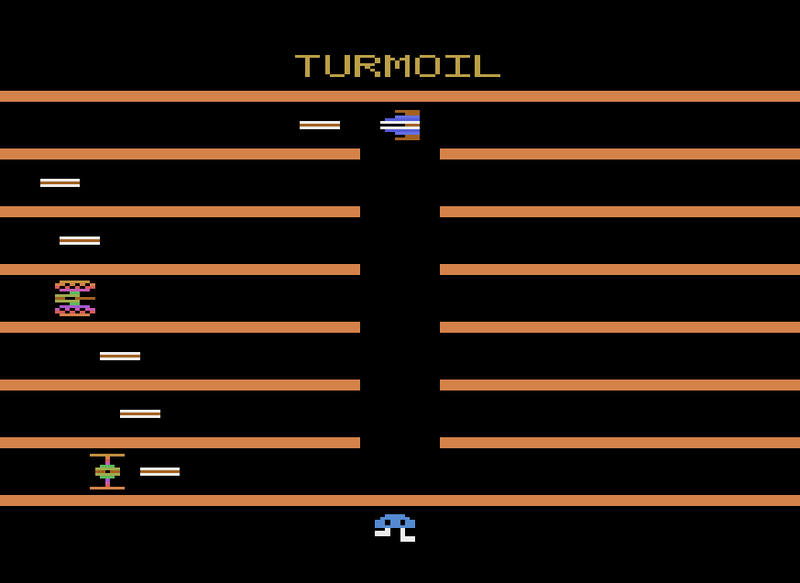 All in all Turmoil is a fantastic game to play, and is a suitable alternative to Tempest, at least on the 2600, if you’d like to buy this game then you’d be liable to pay around 8-10 dollars for a loose copy, or a boxed copy for 25-40 dollars, or if you’re insane a Zellers copy for 40+ dollars, loose. I would urge you to get this game, it’s one of the best examples of that “one more time” mentality that the 2600 is known for, or if you just want some goof arcade fun. This is an excellent game and one of my all time favorites. The screen transition is great and reminds me of the Dazzle Demo in SoundX. Yep. Hands down one of the best shooters for the 2600. Love the Tempest-like game play. The screen transition always seemed to me like it was inspired by the Robotron transition.